The Sheriff's Office and Detention Center have come a long way from its primitive and humble beginnings to reach the state of the art facility we have today. In the 1807 land lottery, the Creek Indians ceded their lands to the government and from the lands Jasper, Walton and Henry counties were formed. On December 24,1821, the state legislature used parts of the three counties to form a new county called Newton; named in honor of Revolutionary War hero Sgt. John Newton. The first brick building, located in the eastern part of the county in the community of Winton, was built using bricks shipped from England. The total cost of construction was the grand sum of $200. Because of this building, the area later became known as the Brick Store community. For many years, the Brick Store community served as the county seat, with the building being used for various things such as a stagecoach stop, store, home, classroom, and courtroom. Also, it served as a jail in the event someone was found guilty and sentenced. Without bars on the doors or windows, a court officer was appointed to sit by the stove fire and guard the prisioner at night. Although it would often leak badly, the building weathered many storms during it's years of service. 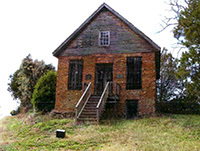 Even with the passage of time, the old Brick Store is still standing today as a great monument of a bygone, but not forgotten era of Newton County. The first sheriff, Lemuel Wynne, was appointed to the office on January 25, 1822 and he took the oath of office on March 15, 1822. The first jail in Covington burned while still under construction. Soon after, a second jail was built just off the square behind the historic courthouse. It was known as a calaboose and was similar to the one room calaboose that still stands in Porterdale. The jail was used for many years until it was deemed unfit to house inmates. In August of 1901, work had begun on a new jail located on the corner of Stallings Street and Court Place, which was later renamed Hunter Street. The building was considered state of the art at the time with a construction cost of around $10,000. The first sheriff to occupy the new structure was Samuel Hay. The jail had a capacity of 40 inmates. 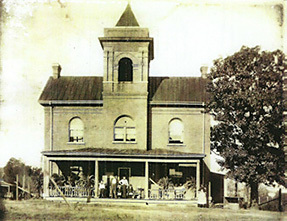 The sheriff lived on the premises and in the summer had a vegetable garden to provide meals for the inmates. In 1985, deputies did not have assigned units so everyone shared a "pool car". Depending on the shift, there were two to four deputies on patrol, and the cars ran twenty-four hours a day, stopping only when they needed to be serviced. At the time, Captain Morris Jones was in charge of the patrol division and Lt. Garland Curtis was in charge of the jail. 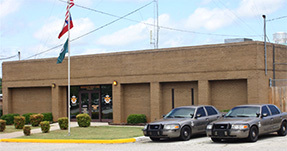 The Sheriff's Office operated its own dispatch center and when manpower was short, officer Tommy Lee Thomason split his duties working two nights in the jail and two nights on the radio. Other detention officers were Sgt. Raydene Thomason, Sgt. Minnie Kate Wilborn, Gwen Hightower and several others. Some of the patrol deputies were Lt. Ezell Brown, Deputy Henry Goss, Sgt. Cleo Banks, Deputy Darrell Henderson, and Sgt. Jimmy Byrd. Vivian Ramsey was the dayshift radio operator.